The UK Payments Council today stated that the use of cash by consumers, businesses and financial organisations fell to 48% of payments last year. 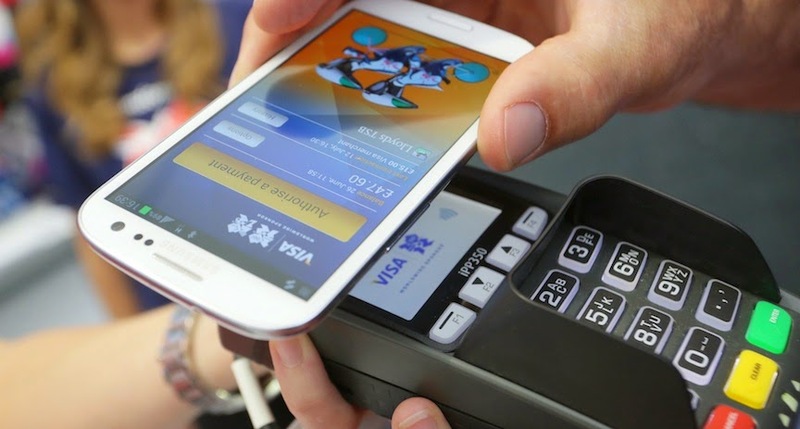 This means that cashless payments have overtaken cash payments for the first time in the UK. The cash volumes are expected to fall further by 30% to some 34% over the next 10 years. It is claimed that 4.4% of adults ‘rarely use cash and the average ATM withdraw has fallen to £67. The previous cashless payment by cheque has dropped to just 1% of consumer payments whereas Debit card payments have now become universally accepted and account for 24% of payments. We all have seen the emergence of credit and debit cards and now the attraction of Paypal to many who simply don’t want to input their card details every time they buy something. Even small value transaction such as a cup of coffee are increasingly done by cards and often contactless cards. Interestingly the migration to plastic has not resulted in a price increase or price differentiation by the retailers. The acceptance of Paypal has been significant catching out many traders who first balked at the higher service charges. However, Denmark is moving closer to becoming the world's first cashless society, with the government proposes scrapping the obligation for retailers to accept cash as payment. They are proposing that as of next year, business such as clothing retailers, restaurants and petrol stations should no longer be legally bound to accept cash payments. Some 30% of the population uses an official Danske Bank app called MobilePay, which is similar to Google Wallet and other contactless cards and links a mobile to other users' phones or to a sensor at the till, allowing you to confirm payments with a simple swipe on your smartphone's screen. The Nordic countries of Denmark, Sweden, Norway, Finland and Iceland lead the world in cashless payments and in and Sweden in 2013 a bank robber left empty-handed, after he found out that the Stockholm bank he held up did not carry any cash..
What is interesting in the UK is to look at the proportion of cash payments by sector in 2014. It is easy to understand low basket value retailers such as discount and convenience stores, pubs and newsagents handling cash (68%, 78.5%, 83.9% and 84.8% respectively), and high ticket retailers such as electrical stores, petrol stations and supermarkets handling significantly less cash (33.8%, 24.5%, 43.8% respectively. However the odd segment identified was Bookshops with 45.5% cash transactions which says that they are low value and maybe more convenience than we think. Whatever, it is clear that the move to cashless is accelerating and with it comes the increasing risk of fraud and transactional payments to third party system and service providers. When we look at the future of on demand and streamed media services the clue is in the word media. We are no longer shackled to thinking of vertical movie, music, games but media hubs that satisfy all under one subscription. To bring the point firmly home Spotify has announced it is adding more non-music content to its app. The expanded service will include radio podcasts, news bulletins, video clips and moves their 60 million regular users which span some into a media one stop shop and they also have introduced a new running mode that matches music to the pace of the listener which is based on feedback from their smartphone's built-in sensors. The news comes on the same day that The Verge disclosed the details of Sony’s Spotify contract and raised questions of whether the model worked in the best interest of the production companies, or the artists. The move is also intended to protect Spotify from competitive threats from Apple’s planned streaming service and YouTube’s expansion moves. Spotify’s content partners include the BBC, TED, the science-tech talks organiser, Disney, Vice Media, comedy podcast The Nerdist and clips from Amy Poehler’s Smart Girls video channel. They will mix musicians and cooks in a show called Turntable. What is clear is that Spotify has a vision past music and one which if successful will help protect it from the new Spotify can provide music that matches a runner's pace. The big question is whether Spotify’s 15 premium subscribers want and will use the extra services today and allow Spotify to float their service on the stock market. Are Enhanced eBooks a Digital Grail? What is the state of the ebook market and are there significant differences between the various different market segments and geographical regions? The question is not new and there are a significant number of opinions on the answers. However, different markets move at different speeds and sometimes in different direction and facts are often out of date and views often reflect vested interests. The BookNet Canada annual survey of Canadian publishers, 'The State of Digital Publishing in Canada' findings may be subjective, but the range of questions asked and the ability to track these against the same survey result from last year, make it a worthwhile read for all and one which should be replicated in other markets. It is easy to relate to; the 93% of publishers producing ebooks, the 50% of active titles that are digitised, 24% of respondents who have digitised over 75% of their backlists, the 52% who have seen increased revenues between 2013 and 2014, but the big question remains on the size of growth we can expect from ebooks moving forward and whether they need to change to realise further market penetration? Interesting questions where again asked on enhanced ebooks. Do we continue to pour the same physical book into the digital container and believe that the job is done? Do we look to enhance the digital version to make it more collectable, even though, increasingly the public are aware that they are not buying, but merely licencing a digital copy? Are we in fact looking at the question of differentiation the wrong way and in striving for the new to be better, losing sight of where the greatest value is perceived and potential enhancement required? The Canadian publishing respondents who believe that enhanced ebooks offer no market impact, has increased from 40% to 73%, with those believing a light impact has decreased from 33% to 20% and those who believe that they hold a positive impact has dropped from 7% to ZERO%. This clear drop in confidence by publishers in the enhanced ebook will almost certainly be self-prophesying and result in fewer enhanced ebooks, which in turn will reduce any market result further. When coupled with the result that only 25% have developed mobile apps, it either says that there is no market demand for digital enhancement, or that it will take others to step up to the plate to make a change happen. Why is the debate relevant today? Firstly, we have seen a flattening out in ebooks sales in the trade market in the developed digital markets. Secondly, we have heard increasing media noise about the love of paper and the immersive and tactile book experience. Importantly we have seen little new ebook or digital content market change. Even the conference and marketing noise has refocused itself more towards eMarketing and less about eContent. Various reports have started to question the market’s appetite for merely more of the same digitally. Finally, the illogical subscription offers have started to unravel as consumers do the maths. As other media segments all look towards expanding their own propositions and consumer reach, the question of who does what, who is in the best position and who owns what, starts to take shape. We often hear about the game and video opportunities for book publishers and assume that book publishers are best placed to realise these, often forgetting the on the other side of the fence the other media segments are eying up books with the same thoughts. However, until an ebook has the longevity to be a true sustainable consumer investment and not just an often non-transferable commodity licence, book publishers may well not wish to waste their resources listening to advisors who are often chasing their own Digital Grails. A 60 Second Battery Fix? One of today’s biggest mobile problems is that of battery life. 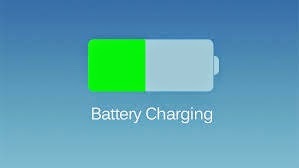 When the battery is fully charge the world is our at out fingertips, but when it is running low or flat then we are effectively cut off from the world. Having to recharge the smartphone can be a chore we would rather live without and the time it often takes to recharge can seem an eternity. So what if you could charge your battery in a minute, it held its charge longer and the battery itself was smaller and more flexible? Using an aluminum-ion prototype, they were able to charge a smartphone type battery in 60 seconds, or 60 times faster than the conventional lithium-ion battery. The protoype consists of a soft pouch, containing aluminium for one electrode and a graphite foam for the other - all surrounded by a special liquid salt. Also they claim that its durability is also greater and that it can stand up to about 7,500 charge-discharge cycles before losing any of its capacity compared to Lithium-ion batteries 1,000 cycles. But it doesn’t stop there and they also have found that there are safety and pliability benefits. Prof Hongjie Dai from Stanford University in California claims, ‘Our new battery won't catch fire, even if you drill through it.’ This could address concerns raised on lithium-ion batteries, which have resulted in recent bans on air transport. Now the challenge is moving what was discovered in the labs into being a commercial reality. Some question the energy density of these batteries and whether the results in the lab can be scaled up, but irrespective the findings start to point the way to creating new opportunities to connect for longer, more efficiently and could open the doors to many new devices and applications. We just now have to wait. The Organisational Impact of Communications in Today’s World? A company may have the best product or service and the smartest technology, but these alone no longer guarantee success. They may have a significant marketing budget, but billboards, page adverts, glossy catalogues and call centres now longer guarantee sustainable success. The supply chain may be well oiled and automated, but reducing waste and delivering to just in time models are by themselves now longer offer unique value and guarantee success. The sales and marketing messages may be slick and focused, but the message in a social networked world is no longer the prize and getting it across to the market no longer a simple process. Mass market advertising still has its place, but direct marketing now is challenging it even in the mass market. Being able to now effectively engage with consumers and feed their habits, respond to them and truly engage and retain them is the real goal. Creating brand loyalty and through that product and service loyalty and a customer for life is the Holy Grail. Once that was the sole domain of the retailer, or end service provider, but in a world of virtual marketplaces the channel to market is changing and with it the communications with the end consumer. Sharing consumers in non-sharing partnerships is the same as not sharing basic trading information before Supply Chain management. We now crave the viral hit. That moment when the word of the internet overtakes all the market budgets we could muster and value and perception truly transfer to the mass. When it works it can create instant recognition, market and demand but is just in time world not satisfying it on demand can be as damaging as not creating it in the first place. However, like winning the Lottery it can’t be achieved by all so bets have to be spread and ‘silver bullet’ strategies avoided. Reputation can be built and destroyed in a click. Consumers, like sheep tend now to follow and identifying the leaders and influences is a challenge to all. It is truer than ever that one bad experience can influence ten others. In fact the numbers are probably significantly higher today and the impact far faster than yesterday’s word of mouth. So what does this mean to the organisation and its focus? Effective trading partnerships across the supply and value chain is more important than ever. In an channel were much is outsourced the performance of others can now often impact a business more than it can imagine. How do you organise your partners and work together for mutual benefit? Who monitors partner relationships and their effectiveness? What information is shared and how does it help the consumer engagement? What is communicated with who, when and how? Service extends to more than throwing goods over the wall, or tracking parcels. Knowing what the other party wants to know and responding to them when they want something is as important as the product they bought. How many of us tear our hair out trying to get in touch with a Google, Amazon, eBay, Apple etc. It’s as if the tablets only ever go one way and those that effectively crack this challenge are the winners of tomorrow. Information is as valuable as revenue. Collecting information for the sake of collecting information may appeal but using that information to engage with all is the goal. However, the challenge is learning to share information in a manner which respects the privacy of the individual but enables partners to help deliver and for businesses to engage with them. Remember when suppliers and retailers started to share forecast and demand information and the resultant benefits that gave to some supply chains? Should we create a CCO (Chief Communication Officer) as it clearly not a CTO (Chief Technology Officer) or a CIO (Chief Information Officer). Perhaps the role fall within the emerging Digital Director remit. Marketing is an obvious home but is often only consumer focused and lacking technology depth. Is a COO (Chief Operating Officer) the appropriate function as is it about process, touch points, messages and responses? Different organisations will respond differently, according to size, skills and complexity of the chain, but communications now needs to be at the forefront of today’s boardroom thinking and developing the appropriate strategy and measuring its performance and effectiveness is an opportunity for all who sit around the board table to engage with. How did we arrive to where we are today? It now seems a lifetime away when we started our technology journey which we w all take for granted today. Back in ’68 there were only 32 computers in the whole of Sheffield and we can even remember the companies, the computers and what they were capable of. The explosion of computing that followed was first aimed at companies and institutions and automating the numbers and providing the information in near to real time as possible. PCs and networks then changed the landscape and importantly companies became aware of the huge waste created across the Supply Chains and started to migrate from, ‘slipping notes under closed doors’ with trading their partners to communicating and sharing information with them. Supply Chain Management opened up communications through EDI (Electronic Data Interchange) standards and technology. Home computing was also born albeit over extremely poor network services. Business then started to look hard at their value chains and their core functions and where they added value. Technology was still see as a generic function but it started to deliver effective ERP (Enterprise Resource Planning) and later CRM (Customer Relationship Management) solutions, which were no longer bespoke but packed and configurable. Outsourcing non-core activity became a given. IT finally started to break through the board room glass ceiling and CIOs (Chief Information Officers) and CTOs (Chief Technology Officers) became common seats around the table. 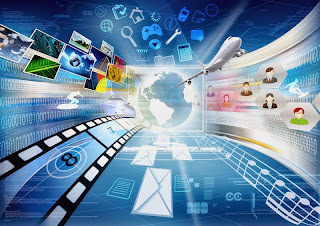 The Internet was born and networks started to move from dirt tracks to super highways and deliver and mobile communications, laptop PCs and consumer technology took off. Then came two major and significant seismic shifts in the form of mobile communications technology and mobile applications. Social networking became something that impacted all; first the individual both young and old and then the corporate, institution and public entity. This explosion of demand was further fuelled by rapid advances in network technology and the emergence of truly mobile devices. We were all permanently switched on and desired to communicate and carried our computer around in our pocket. Where we and other ‘friends’ were, what we are doing and with whom and our thoughts was now often now just a click away. Harnessing all this mass of information and creating ‘Big Data’ opportunities is now a business in itself. Computing was no longer owned by the corporate, even warfare was being waged over the airwaves as much as the battlefield. Fame could be instantaneous at the individual level and commercial success was often no longer reliant on huge marketing budgets and programmes alone. Today commercial businesses now no longer just have a web presence and ecommerce, but an array icons splattered in their sites to link them to every social network where they also have their own presence. We have Blogs, videos, and tweets to promote their products, services and values. In this multi-dimensional world text is no longer enough and communications is no longer one way. We have a new breed of SEO (Search Engine Optimization) and analytic services knocking on every door and customer and market insight programmes are the buzz. So where exactly are you today and more importantly where are you going tomorrow and how do you we achieve that journey? How should businesses organise themselves for the Communications World of tomorrow? Tomorrow we will give our thoughts what we believe is one of the greatest challenges today and into the near future. This week four cultural ministers from four powerhouses; Italy, Poland, France and Germany jointly requested that the EU Commission should think again about the rate of tax for ebooks. This comes only weeks after the EU High Court ruled against France and Luxemburg and stated that ebooks are different from physical books. They want the same rate applied as physical books so countries such as the UK would have zero tax on both, as opposed to zero on physical and 20% on digital. We all recognise that Western Europe is a block of democratic free trading nations with significant economic and political clout. The challenge is often getting that balance between local national interest and collective European interest. If it veers too far to one side it becomes unable to change and what change takes place is often slow and bureaucratic. If it moves too far to the other side it loses its core strength of collective responsibility and benefit. Taxation is a classic battleground where individual countries raise their own taxes and spend them locally contributing a hefty sum to the Union based on their often perceived ability to pay. So we have as many different rates of tax as there are countries and as many ways of allocating these as there are politicians and ideology. So what has this to do with Digital Media and technology? 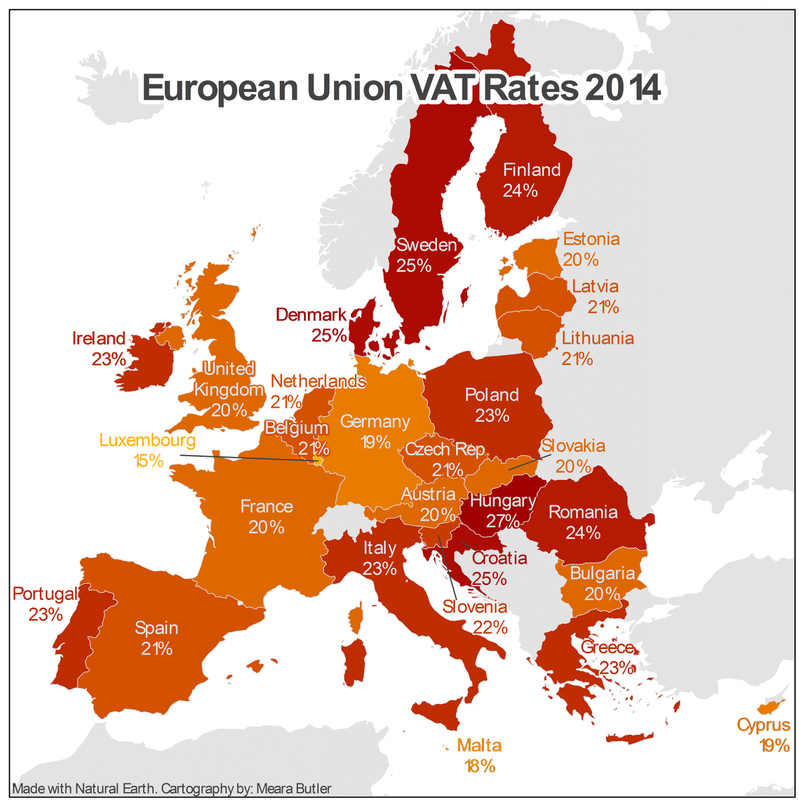 Anyone looking at the different tax rates across Europe would think that someone has made trade less attractive not more attractive. Anyone looking at the tax difference between the digital and physical book would think that someone must have made a mistake and just forgotten to correct it. One of the greatest challenges the European media industry faces is getting the unelected commission and courts to realise that the world has gone digital and that in doing so has created new opportunities not threats. This taxation rule is a daft as the current lack of real action to address the tax avoidance plays being made by multinationals. It is matched by the lack of a rights and IP database. The inability to resell digital goods because…. The balance between common sense and nonsense, micro control and macro control, controlled migration and mass migration are challenges the EU must rise to but repetitively fail to address. But it would be good if we could just have the simple understanding that a book is a book is a book. The price may vary from one form to another but the way the governments view it and the tax they levy against it should be consistent across all formats. Is FingerReader Positive Wearable Technology? We talk of wearable technology and see a deluge of wantabees who all want to be seen in their ‘Emporer’s New Clothes.’ But it often is frustrating that we continue to leave many behind in our search for the next best gadget to be seen with. We were taken aback years ago when we saw the ‘sixth sense’ development of Pranev Mistryand today some of the most exciting technology still remains with the likes of MIT. This week, we read of a MIT’s finger device, which is not an iRing or iWatch mini, but a remarkable device aimed at helping the visually Impaired read and engage with the written word. It is still surprising that some ten years since we wrote the ‘Brave New World’ report and we envisaged the era of the audio digital. However, its mass adoption remains untapped and communities, such as the visually impaired, are still being left behind. We obviously saw then that it was a simple transition from physical audiobook to digital audiobook and although much has happened, little mass adoption either upstream or downstream has occurred. At the time, many saw print on demand and the digitalised text as offering the solution to large print books and specialised monitors, but again much has happened, but mass adoption hasn’t. So what have MIT delivered with their FingerReader? FingerReader is a device which today looks clunky and very much a prototype, but through its camera is capable of character recognition and real time audio delivery. Assisting the visually impaired with effectively and efficiently, reading paper printed and ereader text must be a goal to strive for. FingerReader addresses the issues of misalignment, focus, character accuracy, mobility and efficiency, introduces a new method of scanning text of single lines, blocks of text or skimming the text for important sections on the go, whilst giving the reader instant audio and a tactile feedback. So what you may ask and how does this help others? Well today the initial focus is no the visually impaired and can enable the blind to read without the need for Braille, or the visually impaired to read without large print or blow up monitors. But the technology offers much more to all and takes us one step further towards the true wearable and tactical interfaces we lack today. Imagine just pointing you finger at text and hearing an instantaneous playback and also capturing the text at the same time. We would suggest that this is far more useful than creating a digital watch. Imagine, joining the dots between speech recognition and controls, OCR, Audio and all in the pocket package of a smartphone. Currently, FingerReader needs to be connected to a laptop, but the researchers are now developing an open-source version that will be able to use Android phones. Now that really opens up wider opportunities for all. I have just bought a 1936 Imperial Companion 1 portable typewriter and it now sits proudly on my desk alongside today’s technology. Is it practical? Well not with my poor spelling and tendency to rework things. Does it work? Yes and has a black and red ribbon which will one day need replacing. Did I buy it to work? Well not really, I thought it of it as more of a fusion of art and technology and a statement. 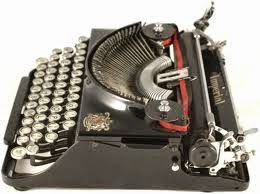 The typewriter played a major role in influencing where we are today. With my wife being granted a Royal Warrant for her bookselling, I also love the Royal Warrant stamp on the Typewriter dedicated to the late King George V.
So what has this to do with last week’s latest technology announcement of an iWatch from Apple? Well no one will expect the iWatch to survive nearly eighty years and work. With our consumable technology today it’s hard to find one of those early brick mobile phones let alone some of the early portable PCs and the life expectancy of many is a mere few years. However, it is possible to see the iWatch as an evolutionary step to shrink technology, change app development and create a fashion icon to rival the Sinclair C5, Delorean car, Google’s Glass and others. But as an investment it is very high risk and not even a gamble. Apple has with the iWatch put a placeholder on the market re wearable technology. The iWatch itself is not the first technology watch, remember those very first digital watches and more recently the eink ones and even more recently the competitors to the iWatch. Apple has the clout and the followers to sell enough to cover their stake, but is it a game changer? Do you want to buy the mark1 version knowing mark2 is probably in the labs today and it will only have a life expectancy of some 2 years? I look at my analogue Longines watch, it is a designer statement, practical and been around for many years. Would I replace it with a clunky piece of technology that says ‘look at me iam a geek’? Wearable technology will happen but exactly how and when is debatable and the challenge it has is that it now has to compete with smartphones that can do everything it can do and much, much more. Eink technology was transient and could never be anything else than a monochrome offer in a Technicolor world, but they established ebooks. Tablets were always going to be caught between the home and the smartphone and when the smartphone fits into a pocket and laptops became lighter and thinner, there was only going to be one mobile winner. Print on demand would show the potential to do short runs but fail to deliver the ultimate ‘distribute and print’ model. So as devices themselves become ‘smarter’ and connected does the smartphone become the communications hub as predicted by our friend and futurist Ray Hammond? As Bluetooth and WiFi expand does wearable technology move close to the sensor nodes and speech, gestures, image and smell recognition become the real wearable technology? Jill O’Neill, Director Professional Development, NFAIS, raised a interesting comment ‘Why can't Apple design and build the Star Trek tricorder instead?’ Now we both would be very interested in one of them! So Who Is Watching and Listening To You? We live in a world of surveillance, moving ever closer to Orwell’s 1984. We are surrounded by CCTV cameras on buildings, streets and inside shops, some would suggest that our internet messages and activity is also being monitored under the guise of national interest and data gathering by software providers on our every click is commonplace. This new business of ‘big data’ appears to be morphing without control and is often hidden deep within the small print that we don’t read. Last year we reported on Adobe’s collecting of eBook reading information through their service, which ironically was set up to protect copyright and the interests of their clients - the publisher, but apparently not their other clients - the consumer. LG was also discovered to be collecting details via some of their TVs on their owners' viewing habits and on what devices were connected to their TVs and was sending this back to the manufacturer, even if the users have activated a privacy setting. Have smart devices now become too smart? Does the technology allow others to look in and to gather data and who and how can we control what we often can’t see and have not authorised? The latest ‘data gathering news’ is about users Samsung Smart TV users who use voice activation to control their Samsung Smart TV. 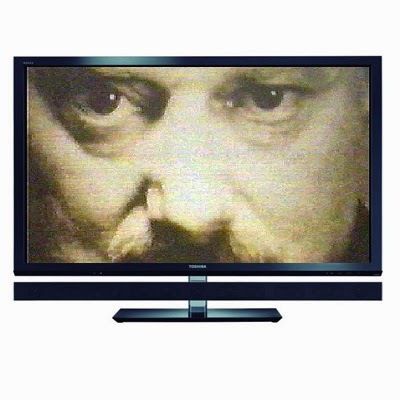 It is now claimed that the TV doesn’t just ‘listen’ to commands but to everything that is said and may share what they hears with Samsung or third parties, which is believed to be Nuance, the voice recognition specialist. It’s like having a ‘Gogglebox’, or worse still Orwell’s vision in every home. The users are unaware they are being monitored and although this story broke via a story in online news magazine the Daily Beast it questions how big this iceberg may be? However, like Adobe, Skype and Viper before them, Samsung then send data to third parties without any encryption! Does this same logic apply to other voice recognition services which are increasingly being deployed on devices? But it is not just about gathering data but also about pushing unwanted data onto the consumer. Recently Lenovo was caught out installing adware onto new consumer computers on initial activation of the PC. The Superfish adware which injects third-party ads on Google searches and websites without the user’s permission has subsequently been removed. Data gathering is done for a number of purposes; to help hone and target product and services to an individual, to sell behaviour and interest information to third parties and to eavesdrop on individuals. The problem is that the technology can often be the same and the lines between moral and not can often blur. Where Libraries Are Sited Is As Important As What They Do? Public Libraries where often built as large standalone buildings in the central Victorian and Edwardian civic centres, many of which remain today. They then spawned local branches with the expansion of the suburbs and even had mobile units to cater for the rural areas. Currently the role and overall library offer is being brought into constant commercial and digital question. Where should they be sited? What should they provide? What is their role in the community? What is difference between local, civic and national Libraries? As UK retail profiles continue to change The Local Data Company, which monitors 3,000 town and shopping centres and retail parks, said 20% of shops in the North of England were now empty, compared 10% in the South and that 20% of the shops it tracked had been empty for more than three years, amounting to almost 10,000 outlets. So we have retail space and changing retail consumer habits. However, it is no longer merely going out of town. UK Supermarkets are having to rethink their store strategy and property portfolio in light of the threat from the bargain market and from the quality end. Big is no longer best and out of town doesn't fit with changing consumer behaviour away from the bulk buy to more frequent convenience shopping. The likes of Tesco has named some 43 stores it is closing across the country. In November, Sainsbury's said it was scrapping plans for new stores, while Morrison’s plans to close 10 loss-making stores this year and there is now a growing number of empty undeveloped space sitting vacant. However Asda, Lidl and Aldi continue to expand but how long Asda will do so is debatable. 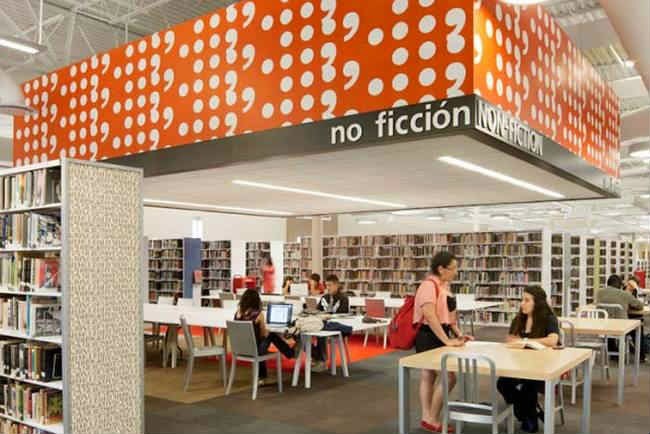 Across the US there are some 130 former Walmarts available and the question on how to reuse these and other ‘boxes’ is now being seriously looked at by all and the success of this and other library community hubs is evident with visitors and activity. 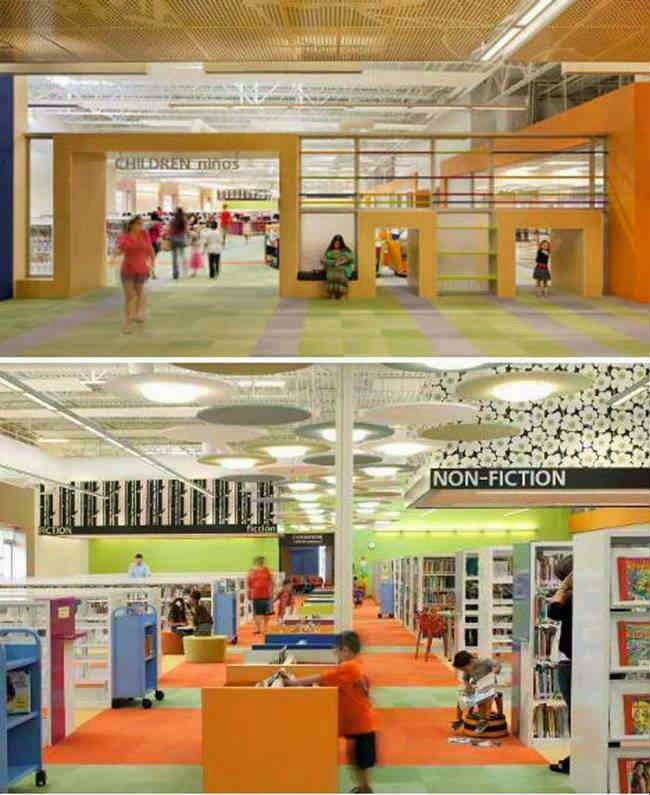 Not every ‘big box’ is becoming a library and there are many examples of transformations across the US. There are many examples where libraries have been located within shopping malls and this concept is not new but the idea of shops within a library may be more novel. Another potential opportunity is to tie libraries and social services into new housing developments in a similar way to how social housing is tied into new developments. This could mean that once a development area reaches a certain size or density then those developments within that area are obliged to contribute a little bit more to the community. Greenwich has done something similar in the new East Greenwich development where it has relocated a public swimming pool, a public library and small housing and social offices within a new private housing development. Whether it locating libraries within malls, creating malls around libraries, location libraries with new housing developments or some other variant, the case is that libraries belong in communities and should not be standalone propositions. Libraries need to do more than simply offer access to books and other information and material. They need to be designed and sited for the 21st century not the 19th century. A List of some of the libraries located in US Malls. Examples of Big Box reuse in the US. Maybe the optimum size of a printed book in the near future will not be determined by the print economics, but instead will be governed by its weight and dimensions. Delivery of small parcels such as books by drones may be science fiction to many, but it is clearly on the agenda of some today. 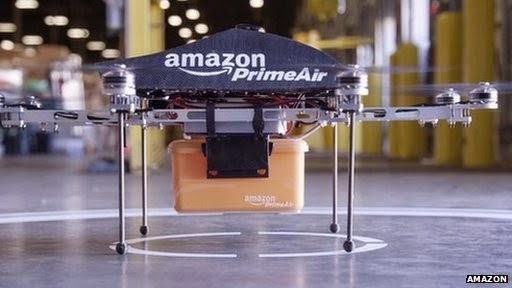 Last November, Amazon's Prime Air was seeking UK Drone experts in Cambridge to help them test drones to deliver packages on up to 2.3kg (5lb) in weight to customers within 30 minutes of an order being placed. Prime Air adverts for engineers, software developers and scientists were posted on Amazon's jobs site. When Prime Air was announced in December 2013, Amazon said it might take five years for the service to actually start and they already have started work in their R&D labs in Seattle. Amazon is not alone in pursuing this technology, with others such as Google, UPS and DHL all trailing services. As one would expect, safety is a major issue and tight restrictions on the use of drones in the US have led Google to carry out its tests in Australia. Now Alibaba, China's biggest internet retailer has gone one step further and says it has begun actual testing of drone-based deliveries to hundreds of customers. The three day trial will be limited to one-hour flight destinations from its distribution centres in Beijing, Shanghai and Guangzhou and also to orders of a specific type of ginger tea which conforms to helping limit the weight. Looking out of the window today at the wind, snow and low cloud, we wonder how many Prime Air flight cancellations will not be due to heavy traffic over London, but down to British bad weather. To watch a Alibaba promotional video. Provisional administrator Christian Köhler-Ma has been appointed to German ebook service provider Txtr. Txtr provided ebook solutions to retailers such as Foyles, device makers and mobile operators such as Deutsche Telecom. They developed a large international repository of ebooks which they serviced through a cloud based white label ebookstore and a comprehensive set of apps. Their service was based on Adobe ACS4 DRM and they sold ereaders based on eink technology. 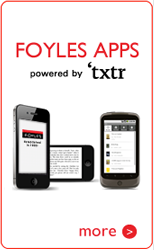 At the time Foyles pinned its flag on Txtr in 2012, Sam Husain, CEO said, “Our new eBook store and apps, ‘Foyles powered by txtr’, make buying and reading eBooks as easy as possible, without the added expense of having to buy new hardware. It is the next step in our on-going journey to serve our customers with a choice of books, across the widest possible range, in every format.” The question now is whether their customers will still be serviced from a bankkrupt cloud? Txtr developed ‘The Beagle’ which they launched in 2012. The 5" device was designed to be paired with a smartphone and to be a "companion reader" with smartphones and subsidized by new mobile contracts. However despite the fanfare, the low price, it was too late to market and came at a time when the smartphone and tablets were replacing the old eink technology. The music industry history is littered with artists who claim they were duped into bad contracts and not paid a fair amount. There are many that claim that the internet is making things worse. There are those whose work fails to earn out and find themselves locked into a perpetual agreement. There are those who establish themselves only to find that the contract doesn’t reflect the change and is inequitable. Van Morrison claims he never earned a cent for writing and recording 'Brown Eyed Girl' and even penned a song, 'The Big Royalty Check' to vent his anger in later years. However, sometimes justice works and those who need it and were duped out of it, get their reward. 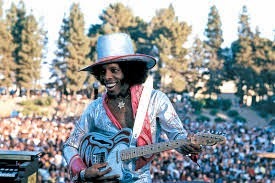 Sly and the Family Stone created a bridge between 60s and 70s white and black audiences and between soul, R&B. pop and were the fathers of funk and their driver Sly Stone was the most colourful of the band. Their hits included ‘Family Affair’, I Want To Take You Higher’ and ‘Dance to the Music’. They even appeared at Woodstock. However, Stone found himself owed millions of dollars in royalties and has been fighting for some 5 years to get paid. Unfortunately, his fight led to years of struggle with him even being homeless and living in a van in LA. In 2013 an appeal was rejected that deemed BMI, Sony, and Warner were not liable to pay and the argument moved towards events that took place back in 1989 when Stone signed his financial control over to his lawyer Gerald Goldstein and the company Even St. Production. He claimed that they had diverted millions in royalties, leaving him unable to get the money he said was due him. Stone, testified that he had not received any royalty payments between 1989 and 2000 but attorneys for Goldstein and Glenn Stone contended that the singer was paid millions, but broke an agreement to make new records. A LA jury has now found in Stone’s favour and awarded him $2.5 million in damages against Even St. Productions, $2.45 million against Goldstein and $50,000 against attorney Glenn Stone. A total of $5 million. However, the defendants claim that they will fight the ruling so the case unfortunately is likely to drag on. Maybe Harris Should Drink Some Costa Coffee? What is more important and best for books, a group of intellectuals sitting round a table, or on a couch, talking about a book, or a good adaptation on film which clearly references the works, or a short story competition that stimulates thousands? Best-selling author and chairman of the Costa Book Awards judging panel, Robert Harris, obviously thinks the couch and in announcing the £30,000 Costa Book of the Year, used his speech to criticise the BBC and its approach to books. He yearned back to the good old days when audiences grappled with Robert Robertson and Melvyn Bragg, often pontificated about the plot and characters in books. Days when authors sat on couches in the limelight and long and obscure words were more frequent than on Countdown. There have been significant successes and at its peak Richard and Judy made respectable numbers. Oprah made a huge impact in the US. BBC at both national and local radio levels often promotes books through its programming and even with dedicated slots such as on the Simon Mayo show. When publishers promotion and marketing works, slots on prime time are available through the likes of the One Show, but there has to be something more than just another story. One only has to look at the huge appeal of crime, mystery and thrillers on TV and correlate this to the cult type following some authors of this genre now have. However the corporation does not have an obligation to provide shows just to promote authors and books perched on a couch. Some would suggest that on the night, Harris, was merely playing to his publishing industry audience, others that he is sadly out of touch. Wise Investment: Kieron Smith or Blinkbox ? So would you invest in a service that still has to prove itself or someone who has done it more than once and brings ability to the table? The troubled UK supermarket Tesco was forced recently to refocused on its core business and as a result dropped its potential universal media service offer Blinkbox. The film/video service was acquired by TalkTalk for a reported £5million and Australian company Guvera entered talks to buy the music service. This left the ebook business Mobcast, which it bought for £4.5m from author Andy McNab and business partner Tony Lynch in September 2012. The Blinkbox ebook service only went live last March. So would you buy Blinkbox ebooks or look at alternative ways to invest less for more? Waterstones went for the acquisition to buy the ebook business from Tesco, but they failed to agree and parted. We now have reports that Kobo are after their customer list which is a good option provided they are active, the sales generated are worth the investment, the data itself is in good order and of course the price is right. However, customer lists are not exactly million dollar purchases and list brokers could probably offer a cheaper and equally attractive demographic. So the clock continues to tick and the question must be whether Tesco will let it go in a fire sale and write off the debt or will continue to strive to find a home for either the debt or the service? It hard to see how BlinkBox ebooks making the return Tesco sought and decoupling the three media streams dilutes further any value it had. Some would question how they had grown to 60 core staff, what on earth they were all doing, the price they paid in 2012 and the level of effort and cost they threw at it to rebranded it, repackaged it and re-staffed it. Some would suggest a classic case of buying a pup and certainly something that they could have achieved quicker and for less money. The markets often don’t follow logic and when someone wants to participate they often lunge for a quick fix and buy what they perceive is a good buy. Due diligence is often hard when its about perception, interpretation and gut feel and none of the major UK supermarkets have been able to bring to market an effective digital media service and with their current refocusing its hard to see them trying too hard moving forward. Waterstones is likewise refocusing and continue to show little appetite, or ability, to take on digital. Some would suggest that buying Blinkbox was never going to fit Waterstones whatever the deal. So today we hear Kieron Smith is joining Blackwells. Now that’s a smart move by Blackwells and considerably cheaper and wiser than buying a service that you would only spend a fortune on, to take apart, to fight a battle you aren’t going to win. Blackwells has always had a good history of digital investment and although they have had their own challenges and very difficult markets they continue to press forward. By acquiring the man and not the service, they bring in someone with very strong digital credentials who has done it before in the trade and someone who has proven his ability to adapt and could well add another dimension to their existing market segments. As pointed out on Dragon’s Den it is often the person that investors should focus on and the service or product may be a bonus. Nielsen's 2014 annual review of the music industry has negative signs in front of chain store sales (-20%), total new album sales (-14%), and sales of new songs online (-10.3%), with only positive signs in front of streaming music and vinyl album sales. 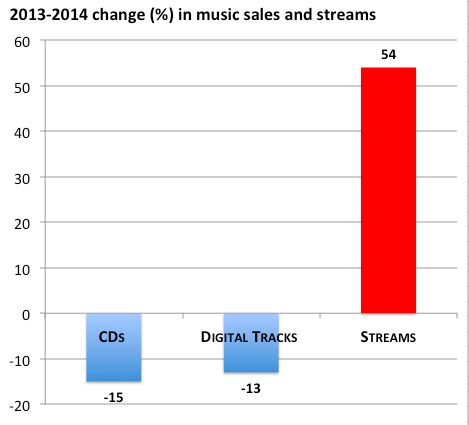 This is despite CD sales in the US generating some $141 million last year. Many believe that the book trade should learn from the digital revolution that is taking place within the music business. The reality is that the music business is very different and right across the music business there is both evolution and revolution. Some changes happening quickly and completely killing off the past, whilst others are slowly evolving. 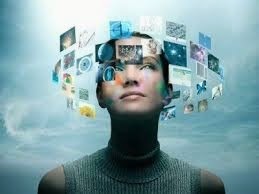 From creator to consumer digital change is taking place. We see many changes at the consumer end. Technology has replaced the preceding technology. Eight track was replaced by cassette, cassette was replaced iTunes, iTunes downloads was usurped by MP3 downloads, which is being replaced with streaming on demand. This is without the parallel evolution from MTV to YouTube and the growth from digital internet radio stations and music discovery services such as Shazam. Music owners have in the past been forced to replace their collections, but the new streaming technology now questions why they would want to reinvest yet again when it’s all available on demand. On demand is itself is fuelling subscription. The changes are logical but the speed of change is significant and the redefinition of ownership has enabled many to rediscover vinyl whose sound was of a higher quality, but its market share is still only 3.5%. When we first started this blog we thought Spiral Frog would capture the new market, but they failed to cross the line and their place was taken by Spotify. Spotify now claim 35 million songs on their service and there are many more renditions now on services such as YouTube and SoundCloud. But even with this enormous repository of songs many still go unheard whilst others, like butterflies have one season in which they flourish. When you look at the production, distribution and business, change is often less revolutionary and more evolutionary. Social networks and self-promotional marketing are starting to eat away at the mid list. Unless you are in the top 1% which generate 80% of the money, then you may have to rely on the hit makers which now are TV driven by talent shows such as The X Factor, The Voice, Pop Idol. To be a hit, you now need serious financial backing, or social pull. With these changes come changes in the reward structure for all. Some will say that there are now too many sticky fingers in the diminishing pot. So artists are having to rethink the old models and balance greater control and percentage of revenue, against lower revenues and often chump change return. A good friend and musician commented to us only this week that selling direct gave them 100% whilst scattering to the digital unknown gave them little. Merchandise, concert revenues and secondary rights are growing in importance. This impacts how artists are managed, make money, record and distribute. It changes where the producers and labels make their money and the increases the importance of the back catalogue and Intellectual property. So can books learn from music? The consumer end is very different and what is clear is the physical book isn’t going away in all sectors and will retain a major share of the market whilst the distribution economics can support it. However, like music the pot is not growing but changing and this is putting similar strains in the production and development area of the value chain. There are many similarities here with respect to back list, mid list and front list and self-publishing. Even signed authors are having to work harder on their social skills as publishers rein in the marketing and promotion to focus on the best shots. The one thing that all media segments share is the polarisation of value at either end of the value chain and reducing influence of the middle to many. The internet age has started to enable classrooms without walls, or even borders and promote the leading educators to engage with all students. But is this reality today or merely technology waiting to be adopted and adapted and fighting much educational technology inertia? We have the same curriculum and exams, but an often significant variance between how students are engaged, motivated, learn and achieve the standards sought. Learning resources, such as textbooks help teachers to deliver the lessons, but can now technology allows them to do it smarter and more consistently? One approach comes from, The Stephen Perse Foundation in Cambridge. They are a leading UK private school and the current ‘Independent School of the Year’, boast some of the best results in England and have announced that they are publishing 12 digital multimedia textbooks for IGCSE biology. The textbooks will be available to download free online from Apple's iBooks online store to use on iPad tablet and cover an entire exam syllabus. The course is currently taken by some 500,000 students in 160 countries. They also plan to extent the list to cover other topics such as molecules and enzymes and animal nutrition and already claim to have had a significant market response to their 100 course they have made available through iTunes U courses. Today Amazon announced another new approach via KDP EDU, or what they refer to as Kindle Textbook Creator. This is aimed at empowering all to create eTextbooks and other educational content that is enhanced with digital features such as notes, flashcards, bookmarks and highlights. Content can be prepared, published, and promoted as eTextbooks alongside and other learning material and all can be access on tablets, iPads, Android tablets and smartphones, Macs and PCs. This venture could therefore allow the best educational authors to do it themselves, to self publish and lead to an explosion of material and provide choice. But who will determine the good, bad and indifferent? Kindle Textbook Creator claims to make it easy for ‘anyone to take any PDF and create a richly featured and widely available eTextbook.’ Kindle Textbook Creator will offer authors royalties potentially up to 70%, while keeping their rights and maintaining control of their content. They can also enrol their books in KDP Select for additional royalty opportunities like Kindle Unlimited and the Kindle Owners’ Lending Library, and access to marketing tools like Kindle Countdown Deals and Free Book Promotions. But are these potential extras real opportunities for this material, or false incentives to lure authors? It is often said that each of us has a book inside us and self publishing is unlocking many of these today in the trade market. But does every teacher have a textbook inside them and will this start to unlock these or will the lure of the reward still deter the best to stick with the traditional route. So which publishing model will prevail, the self published, the traditional, or the best school? Many big questions remain. How will Amazon police copyright, through the implementation of plagiarism-detection services and links to registration databases, to ensure copyrighted material, be it text, pictures, artwork, graphs etc doesn’t merely just get ‘cut and pasted’ into a new work. How will quality rise to the surface and will there be a mass adoption of ‘my textbook, teacher notes and associated material, or will the majority opt for the tried and tested and publisher underwritten option? Will a flood of resources effect the current pricing and drive down or raise the cost of traditional material? Today there should be no reason why the standard of education is governed by location, your purse or access to materials and resource. Yet education is still localised, standards vary and engagement is down to individuals. Facilities such as TED Ed and the Khan Academy are viewed with skepticism by many, some would suggest that the curriculum is more geared to robotics than to learning and the take up of technology varies significantly in spend, application and quality. 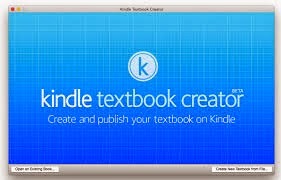 To learn more about publishing textbooks through KDP, or to download Kindle Textbook Creator, visit kdp.amazon.com/edu. To learn more about The Stephen Perse Foundation’spublishing programme.